Herbsmith Stephania Harmonize Joints offers joint support and calming for the vulnerable, excitable horse. This blend is for joint discomfort, achy limbs, and muscle aches and discomfort that often result from training and everyday activities. For a horse with spooky behavior, restlessness, or irritability, the herbs in Herbsmith Stephania Harmonize Joints also have a calming effect. This blend is used to support joint and limb health in the horse that is too excitable and easily over-stimulated. The resolution of the discomfort is often accompanied by a calmer and easier to handle temperament. 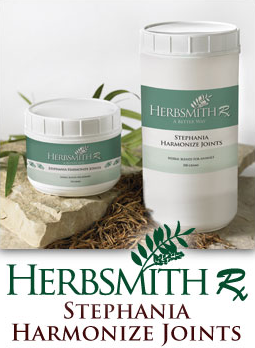 Herbsmith Stephania Harmonize Joints unblocks and relaxes the channels, or meridians, and invigorates the blood. In Chinese medicine, it is used to treat blood stasis, wind and dampness in the channels and collaterals characterized by joint, limb, and trunk discomfort, muscle aches, and numbness in the lower extremities. This blend is indicated for conditions that are primarily excessive. Traditional Formulas: Administer two (2) tablespoons twice daily for the initial twenty days. Then, administer two (2) tablespoons once a day therafter. Note: In the event the horse refuses to eat herbs, start with small amounts in the grain until the horse is acquainted with the taste or try the Flax Plus version of this formula. Almost all horses will eat the herbs in their grain. Flax Plus: Administer one (1) scoop twice daily for the initial twenty days. Then, administer one (1) scoop daily. Six tablespoon scoop included. Precautions: Not to be used in pregnant mares some herbs in the blend could cause uterine contractions. Not to be used in a horse with diarrhea.